CHAUVET DJ’s compact Intimidator Wash Zoom 350 IRC moving head puts the power of a world-class lightshow in your hands with breathtakingly brilliant colors, lightning speed, and professional features like a 14°-58° motorized zoom, not typically found in wash fixtures in its range. Measuring just 10.6 x 7.6 x 14.3 inches (270 x 194 x 363 mm), this little dynamo is fitted with 7 high-output 20-watt RGBW LEDs that provide smooth, shadow-free color blending, along with knockout illuminance of 14,520 lux at 2 meters (14°). 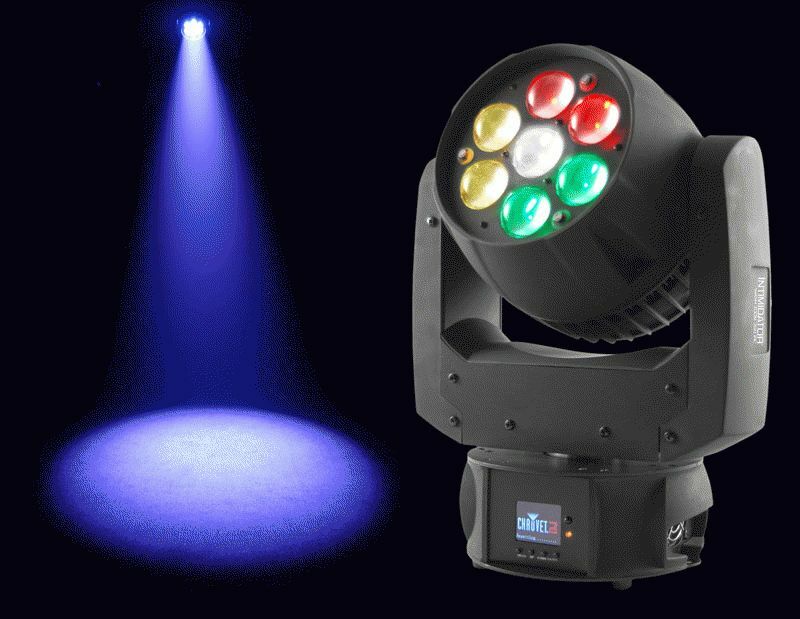 Not only is it ultra-bright, the Intimidator Wash Zoom 350 IRC is also packed with features, controllable both via DMX and manually, that make it easy to achieve the more elaborate professional-style lightshows that nightclubs and productions are demanding today. Stellar among its pro features is its wide-ranging 14°-58° motorized zoom, which gives it the flexibility to be used for short-throw or long-throw stage and wall washing applications. Another standout capability is 4-zone control, which allows the Intimidator Wash Zoom 350 IRC to generate electrifying chase effects, in addition to functioning as a high-output color wash fixture. This zonal control, combined with the unit’s exciting built-in automated programs, make it fast and effortless for virtually anyone to create complex visual looks without DMX – designs that appear to be the work of a skilled lighting professional. Ideal for discos, nightclubs, DJs, mobile entertainers and live events, the Intimidator Wash Zoom 350 IRC is equipped with other features that make it extremely user-friendly for operators of all experience levels. For example, a full-color LCD display with text readout provides at-a-glance control of its built-in, automated and sound-activated programs. Utilizing its built-in programs, it can be run in multiples in Master-Slave mode to easily generate a synchronized light show over a larger area. As another non-DMX option, the Intimidator Wash Zoom 350 IRC can be controlled and triggered wirelessly via CHAUVET DJ’s easy-to-use IRC-6 infrared remote controller (sold separately). With the IRC-6, users can instantly access pre-programmed scenes, achieve exact colors from manually-set RGBW percentages, and make adjustments on the fly from distances up to 30 feet (9 M). For users with more advanced programming needs, the Intimidator Wash Zoom 350 IRC offers two DMX operation profiles, 14- or 29-channel. It is equipped with 3-pin DMX connectors for data linking. “With its high output, Quad-Color LEDs, motorized zoom and many other pro features, the Intimidator Wash Zoom 350 IRC is definitely a top-of-the-line fixture in CHAUVET DJ’s popular Intimidator series,” said Allan Reiss, Senior Product Manager for CHAUVET DJ. “But one of its most appealing characteristics, as far as smaller venues and working entertainers are concerned, is the way it makes it so easy to achieve a professional-caliber light show -- even for those without any programming experience.